A trip to Victoria wouldn’t be complete without saying hello to the Little Penguins on Phillip Island. Not only will you get to chill out with these little fella’s on this tour but you’ll also experience the magic of ‘Moonlit Sanctuary’ and see some wombats, koalas and dingoes as well. A trip to Phillip Island in the Ultimate Eco Tour is nothing short of unforgettable, highlighting the best of Victoria's nature and wildlife. At your fist stop, you’ll say hello to all the friendly residents of Moonlit Sanctuary Wildlife Conservation Park. You’ll get to hand-feed the kangaroos and wallabies, have your photo taken with a koala and learn all about the conservation of these amazing animals. After lunch, overlooking a billabong teeming with waterbirds, you’ll start to make tracks to the historic Churchill Island. Whilst learning about the significance of this small island and its history, you’ll get to see stockwhip cracking, sheep shearing and working dogs in action (time permitting). 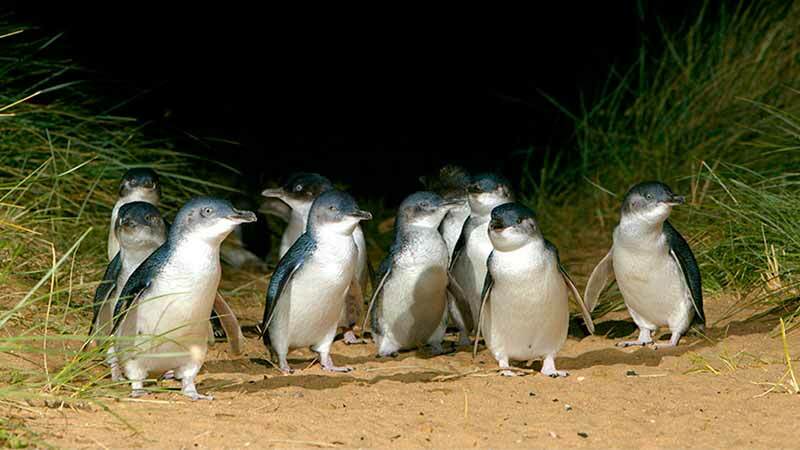 Then will head over to the home of the Little Penguins, Summerland Peninsula for the world famous Penguin Parade. Here you’ll see hundreds of Little Penguins come ashore just after sunset, make their way across the beach and up into the sand dunes to their burrows. A natural wonder you will never forget! We recommend you book as far in advance as possible.